When working on systems and performing repairs here at Rethink we see almost every trick in the book for loading your system with spyware and malware, but today we are going to focus on unwanted browser toolbars. 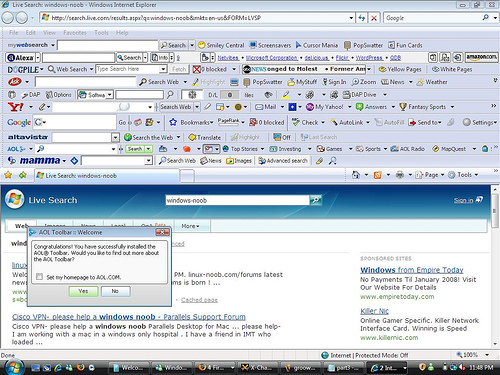 While poking around for problems, I almost always encounter the same oddity: a Web browser packed with toolbars. Sometimes I’ll find two or three of them, sometimes even more. Maybe it’s a Yahoo toolbar — for someone who’s not a Yahoo user. Maybe it’s a security toolbar from the likes of McAfee — even though the user runs Norton anti-virus. Very often it’s some weird shopping or promotional toolbar that is sure to be up to some devious marketing tactic. Some people have DOZENS. Invariably I ask the question to find out if the customer actual uses them or wanted them. The response is always the same: “I don’t know how they got there.” Guess what? I know how. You installed it without probably even realizing it. Well, okay, you didn’t write the code, but there’s a very good chance you allowed them to be added into your browser. That’s because software developers often sneak toolbars into their installers, and users often click right past the option to opt out. For example, you recently had to update your Java installation, a hassle that happens so often, when the time comes that you can’t take the nagging any longer, you usually just click through the installation as quickly as possible. And Java isn't the only major software vendor that does this. An experienced and watchful eye would see this attempt and stop it. It was simple enough to clear the checkbox and bypass installing Ask, but for someone who isn’t paying close attention or doesn’t know any better, bam: new toolbar. I see this tactic all too often as the power of the marketing dollar is so much that even legitimate companies sneak these into their installers. Once respected companies like Download.com from CNET even d this, and sometimes even worse than others. During a typical install of a small piece of software, you may be prompted up to 5 times, FIVE TIMES, to install toolbars and adware software. In short ,When you install a new program, especially if it’s freeware or shareware, don’t just blindly click through each page of its installer. Take your time, and make sure you’re not inadvertently agreeing to install a toolbar as it may be the beginning of a trip to our computer repair center for a virus removal service.